There’s much to celebrate as Army Sergeant Bowe Bergdahl goes back to his family in Idaho after nearly five years in captivity in Afghanistan. Yet pivotal questions arise this morning as details surrounding the case surface, including Bergdahl’s leave from his army base and his father’s possible ties, at least via social media, to the Taliban. It is still a mystery why Bergdahl, 28, voluntarily left his Army base five years ago, suggesting he deserted or went missing, according to a USA Today story. “It’s not the modus operandi for Islamic terrorists to detain American troops when captured,” Allen West, former Congressional member and retired U.S. Army lieutenant colonel, said. “Our troops are brutally, ritually, and savagely murdered — to include American security contractors (remember the Fallujah bridge) — not held for five years,” West wrote on his website. Bergdahl’s father posted this message while his son was still in captivity. Both Bergdahl’s parents have been long advocating lawmakers and others in Washington for their son’s release, making use of social media platforms. 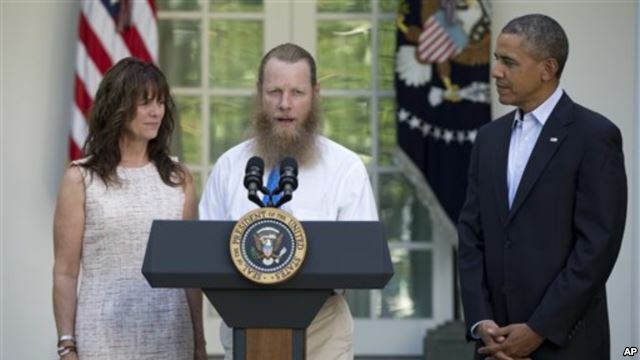 The extent of the relationship between Bergdahl’s father and the Taliban is not clear. Ranking Republicans on the House and Senate armed services committees have expressed outrage at the exchange of five Guantanamo Bay terrorist for Bergdahl, saying it violates U.S. law requiring Congress to receive 30-day notice before Gitmo prisoners are released. The five released are of the most dangerous Taliban commanders in U.S. custody, according to a report in the Weekly Standard. The Taliban had previously demanded their release as a precondition in initiating talks with the U.S. The Obama administration has been keen on engaging the Taliban but has not made any gains. Looks like the father has converted to islam. Just because he spoke Pashto with Ubama in the Rose Garden? Obama knew what he was doing.Accelerating the power of sharia, jihadist Islam. The CIC is a Quisling. To understand the taliban read the al-qaeda glossy magazine called Inspire.